I was fortunate enough to live-blog at the inaugural TEDxColumbus event this week at the Wexner Center for the Arts on the OSU campus. While all of the talks were interesting, the research of two speakers with a technology focus--Norah Zuniga Shaw and Chrystie Hill--stood out to me. Norah Zuniga Shaw wants us to understand the concept of “counterpoint”—things that don’t seem to have structure really do under the surface. In her “Synchronous Objects” choreographic visualization project ... she and her colleagues worked with William Forsythe to deconstruct once of his dances—One Flat Thing, reproduced—to see what physical thinking might look like displayed visually. His dance incorporates a high degree of difference, with the “dancers constructing a cacophonous structure.” Click here to read the rest. In 1999, while attending library school, libraries were rethinking access based on technological advancements. In thinking of the library, she felt there was a disconnect between the community aspect and the reference desk—which she saw as a barrier between herself and the people she wanted to serve. She set out to change this by incorporating community features into the library’s role. Click here to read the rest. I always like to see interesting examples of technology transforming the way we live and how we think about things. These two speakers highlighted that for me. I'm willing to take on arguments but I'll go on record that I think the greatest computer game is Tetris. Simple and addictive, Tetris is a game that stands the test of time without any artificial 'retro' appeal and has been played by an extraordinarily wide variety of players. A few weeks ago I came across a link to a documentary on the early history of Tetris from the BBC, now available on Google Video and over the weekend had enough time to watch it. I had no idea, back when I was playing what was surely a pirated version of it in my college apartment, the history of how Tetris was made and how it made it out of Russia to become the hit it was then. After I watched the documentary I scoured the bottom of my closet to try to find the only video game system I've ever purchased - the bright yellow original Gameboy with Tetris cartridge. Alas, I couldn't find it. I hope I do have it somewhere. Some fresh batteries and my obsession with getting rid of those lines at the bottom will begin again! It was hard to ignore the hype around the recent release of the Sony Playstation 3, especially here in San Francisco. I suspect many people will be making the tough Christmas decision between that and the Nintendo Wii. Or will you get both? I have no opinion and will probably get neither but do really wonder if those photos of the damage to someone's TV from accidentally throwing the Wii remote are true. That's some serious gameplaying. The UW CSE Colloquium features accessible talks by leading computer scientists and computer engineers from the University of Washington, the region, the nation, and the world. You'll see the schedule of their live and televised talks as well as being able to download others via the website. There's a way to search, but if you trick the date drop-downs a bit you can see them in browsable lists. The content is really varied with "Understanding Venture Capital" listed right next to "The Learnability of Quantum States". There must be other archives like this that I'm just not familiar with: please drop any links for them into the comments! Yes, I've been neglectful. I left you hanging on the eve of SLA and then never returned. The great thing about conferences is that you meet new people and get new ideas and then come home. And, if you're me, you come home with big lists of new ideas and new things you want to try out and enough energy to get you through that first week where your desk soon becomes covered in spreadsheets and flowcharts and even very old style scissors and tape as you weed through these lists and ideas to figure out what's really important. That's what I've been doing. The piles are sorted out a bit more clearly now and I've become focused on a couple of areas: first, getting CR linked in to other resources more - like Google Scholar and Windows Live Search; and, second, promoting CR internationally. Those are what has emerged as my main focii (is that right?) for the latter half of the year. I'm in Arlington VA at the SSP conference. It's the first time I've come to this one and I'm finding it very interesting so far. Most often, when I'm doing the day-to-day work I do for CR, I don't have time to think about "publishing issues" - I'm more interested in making things work and pushing new features, but not so much thinking about the more theoretical or more experimental ideas related to what we're doing in the broader sense. This afternoon I attended a well-done seminar on access and authentication where the panelists discussed the issues we face about how we give access to our content to the proper people (and keep the improper, I guess, people out) and some of the technological ways we can make this happen. Finally, finally, I think I can wrap my head around Shibboleth, the vague idea of which has been rattling around there for probably the better part of a year. I don't know if it was the context, or just being allowed to sit and think about it for a while, but I can now see it in the context of what we're doing at CR. I did note that around 4:20pm I laughed out loud at a joke about NISO as did others around me so maybe I have been firmly assimilated into the group here. Most of my conference time over the years has been spent at SLA so I really only have that as a comparison. This is smaller, of course, and so the exhibits are smaller. Much as I'd love to spend lots of money on backend systems for CR that's not what I'm most interested in. I did talk to a vendor about tools for producing better usage stats, which is something I believe we must do better and have been looking at myself without a lot of progress. 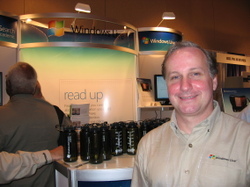 I also stopped in at the Windows Live Academic Search booth to say hi to an old friend and colleague Mike Buschman (there he is on the right). Mike gave me a demo of Academic Search and talked about where the product is going (and I want to talk to him more about where CR might go along with it!). It was a bit of a weird experience because I'm used to seeing Mike as my client so to do the role reversal and get schwag from him was strange! I'll be on the vendor side of the booth at SLA next week so things will be back to normal soon enough. Of course the best way to spend a Friday afternoon before a long weekend (it's the Memorial Day weekend here in the US) is to roll over the live site to a new server. But that's exactly what we've just done and we hope you'll enjoy faster page loading times and less congestion on the site. We'll be continuing to test and tweak throughout the weekend (before we break for BBQ and beer, we promise!) and look forward to coming back on Tuesday to a much better performing Computing Reviews. We will be publishing on Monday but on a lighter schedule and hope you enjoy your weekend, long or short as it may be. The latest issue of Communications of the ACM has come onto my desk and I notice that the most downloaded article from the ACM Digital Library is on blogging - "Blogging as Social Activity, or, Would You Let 900 Million People Read Your Diary" (subscription required to download the PDF) from a 2004 conference. CACM is an interesting read for me each month - many times I find myself going back to articles in it and I always get something out of the figures with the arrows and boxes even in articles where I don't read or understand much of the surrounding article. And now that I've typed that I'm reminded of Boxes and Arrows, which I haven't visited in a while. I'm not sure I have the time to catch up!